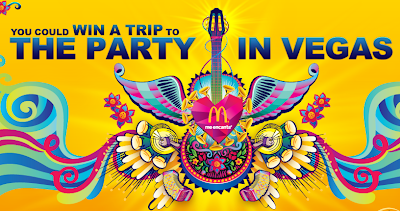 Check out McDonald's newest giveaway, where you could win a 4 day 3 night trip for yourself and one guest to Mandalay Bay Hotel and Casino in Las Vegas, NV, two tickets to the Official Latin Grammy Awards after party, a chance to walk on the green carpet, and $500 in spending money! To enter all you have to do is visit the McDonald's contest page (click here), enter your information, and enter once a day through October 21, 2013. Check out all the Official Rules here. Five (5) Grand Prizes are available: Each Grand Prize winner will receive a four (4) day/three (3) night trip for the winner and one (1) guest (who must each be at least 21 years old at time of Event) to attend the 14th Annual Latin GRAMMY® Awards (the “Event”) scheduled for November 21, 2013 at the Mandalay Bay Hotel and Casino in Las Vegas, Nevada. Each Grand Prize consists solely of: round-trip coach-class air transportation for the winner and one (1) guest on Sponsor-selected dates from a Sponsor-selected major airport near the winner’s residence to an airport in or near Las Vegas, Nevada (winner and guest must travel from within the United States); hotel accommodations for two (2) (one (1) bedroom suite) at the Mandalay Bay Hotel and Casino for three (3) nights; ground transportation for the winner and their guest between the airport and the hotel in Las Vegas; two (2) tickets to the 14th Annual Latin GRAMMY® Awards (seating to be determined by Sponsor); the opportunity to walk on the 14th Annual Latin GRAMMY®Awards green carpet; two (2) tickets to Official Awards after-party (subject to availability); five hundred dollars ($500) spending money (awarded in the form of a general-use prepaid card selected by Sponsor); a fifty dollar ($50) McDonald’s Arch Card®; and one (1) McDonald’s branded T-shirt, ARV: $15. Additionally, each Grand Prize winner and their guest will each receive a three hundred dollar ($300) credit for the Mandalay Bay Hotel and Casino spa that can be used between November 20–22, 2013. All activities are subject to availability, and inclusion in the Prize at the sole discretion of Sponsor. Approximate retail value ("ARV") of each Grand Prize: $4,000. One Hundred (100) First Prizes are available: Each First Prize winner will receive one (1) $20 McDonald’s Arch Card® and one (1) McDonald’s branded T-shirt, ARV: $15. ARV of each First Prize: $35. Arch Card is subject to its terms and conditions (found at www.mcdonalds.com). The size, color, and design of the T-shirt will be determined in Sponsor’s sole discretion.